“What is my true vocation in life?” It is a question most, if not all, young men ask themselves. For those who feel a call to serve the Lord and His people in the Diocesan Priesthood, we invite you to consider a journey of discernment through prayer, spiritual direction, and seminary formation. Any man thinking about becoming a priest can speak with his pastor or another priest. He is also strongly encouraged to begin a dialogue with a spiritual director as well as the Diocesan Vocations Director. Click here for more information about priestly vocations. 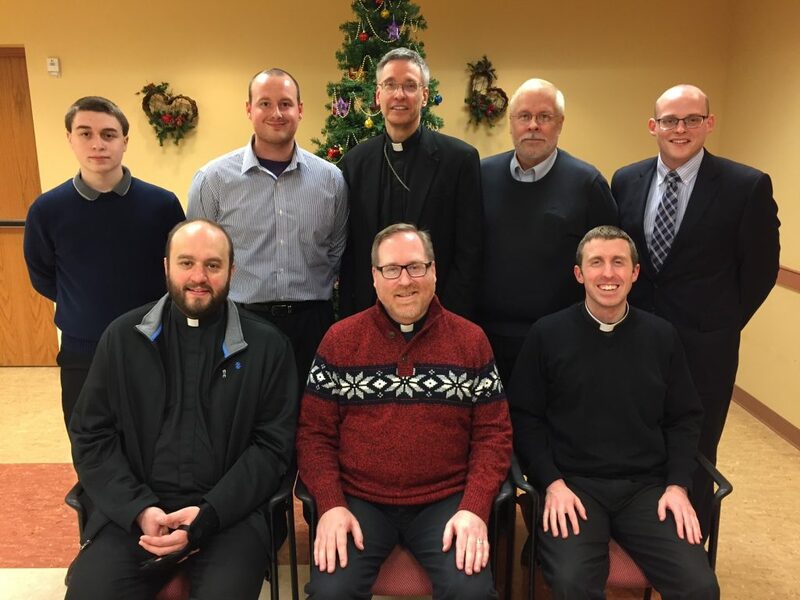 Bishop Mark and Vocations Director Father Matthew Reese pose with some of our Diocesan seminarians at the Bishop's annual Christmas gathering for seminarians and prospective seminarians on December 19, 2016.